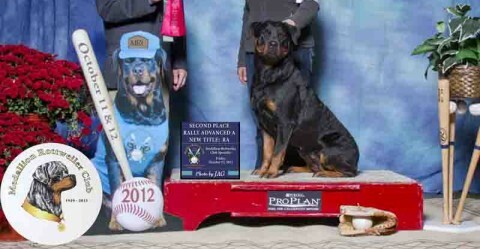 A few years ago, a good friend and long time rottweiler owner lost a beautiful and talented young dog due to a inherited disease – Juvenile Laryngeal Paralysis & Polyneuropathy (JLPP). Thanks to the work of researchers at the University of Missouri, College of Veterinary Medicine, and their collaborators around the world, they identified the mutation associated with JLPP in Black Russian Terriers. A DNA test is now available to determine if a dog is a carrier of the mutation or at risk for JLPP. In researching this disease, they discovered that there was more to this disease than JLPP. In addition to those signs, affected dogs also have ocular abnormalities such as cataracts and they have a degenerative change in their brains with neuronal vacuolation. Thus you may also see this syndrome referred to as Polyneuropathy with Ocular Abnormalities and Neuronal Vacuolation (POANV). As of November 1, 2016, the ADRK will require that all breeding pairs to be tested for JLPP. The attached article on JLPP describes the disease, how it is inherited, and why testing is so important. JLPP is inherited as a recessive trait. That means that in order for the disease to manifest, a puppy must inherit one recessive trait from each carrier parent. When this occurs, the pup who received both of the bad recessive traits will die. There is no cure. It is, therefore, very important to the future of the breed to identify carriers through the DNA testing AND by making such results public through the OFA database! The researchers believe this mutation has been in the breed for a very long time. The recessive mutations just were not recognized until they become widespread enough in the breed that the odds of two carriers breeding become higher. With the age of this breed, it is expected that there will be many carriers identified – some from well-known and long established lines whose progeny are found around the world. What should you do? Make your dog’s test results public on the OFA database. What do I do if my dog is a carrier? We are very fortunate that the mutation was identified so quickly! Now all Rottweiler breeders must become educated on this terrible disease!